Cause of her death was a diseased heart, 1year certified. In 2017 family letters revealed some of the mystery that had pervaded for over 200 yrs regarding her marriage to Robert Fenn. Robert's reprehensible behaviour is clearly seen to have upset Harriet's righteous mother Harriet. But daughter Harriett's view remains unknown, although some 40 plus years later, she names Robert Fenn gent as her husband, on her tombstone. Her father Thomas clearly put her inheritance beyond the reach of Robert, when he wrote his will in 1833. Alston Fenn writes in the 1950,s "I have a nice water colour of our Gt Grandmother Harriet Liveing (now in the possession of E L Fenn 2017) who married Robert Fenn and whose mother was Harriet Harrold. It was given me by Dolly (Cotes). I wish I could find out something about Robert Fenn, we know he left Harriet but where he came from or where he went is a closed book"
It was not of course, much is now known of Robert and some of his life. Harriet is mentioned in many letters written by her mother Harriet, she later lived at various family address's, when she was separated from Robert. 1861 Census lists for 31 Bear St Nayland; Harriet Fenn Widow 70yrs Fund holder. Head of house. Sarah Daniel visitor un 60yrs.Companion. Eleanor E Cousins un 21. Servant. 1831 Harwich. Harriet's mother writing to Edward her son says " Harriet is very poorly she is so pale she vexes me when I look at her . . . . . she will fret . . . . . fearing that Robert will lose the situation . . . . . should the Reform Bill pass we . . . . . we can to make her hope for tho. . . . . as . . . . . To leave the . . . . . to God. I have observed to her that even if it . . . . . had in it it might not eventually be best. I want her to lean more on God and less on man. Charles writes that he is much liked and he has no doubt but he will do well, and if Clerks are appointed it is most likely he will be established". 1836 April? Harwich. Harriet's mother writing to her daughter-in law Catherine Liveing (Katy) mentions Harriet in connection with buying some pigeons "knowing you and Edward are fond of them Harriet bespoke half a dozen when they could be obtained, these I have now sent were brought this morning, they are wood birds as you will see, Harriet thinks the flavour of them is higher than the tame pigeons".
. . . . . Aunt Downes has been with us nearly a fortnight - Harriet is gone home with her - they left us last Tuesday - on Friday they hired a donkey and cart and went to Denham? To see Uncle and Harriets children - they heard from Edwards account to me that Uncle was not at all likely to come and see us this summer as he is so lame so my Aunt wishing very much to see him took that mode of convenience . . . . .
Harriet is named a beneficiary in her fathers will dated 5 Oct 1833 and described as the wife of Robert Fenn. However her legacy is placed in trust for her and "her present or any after taken husband" specifically denied any benefit from the proceeds. The 1851 Census records Harriet as a widow. Her grave in St James Churchyard Nayland reads "In memory of Harriet widow of Robert Fenn gent who died March 28th 1864 aged 74 years. What doth the Lord require of thee but to do justly and love mercy and to walk humbly with thy God"
Death Cert No 477 Dist Sudbury-Bures, registered 13 Mar 1864. confirms age at 74 yrs. Occupation " Widow of Robert Fenn landed proprietor". Informant "The mark of Eliza Burrows present at the death Nayland". Will dated 27 Feb 1864 was proved 2 May 1864, at under 1000pds by sons Robert Liveing Fenn Gent of The National Debt Office and and Thomas Harrold Fenn Surgeon of Nayland, executors and sole beneficiaries in equal shares. Portrait of Harriet in possession of E.L. Fenn Auckland N Z 1998. 1. Marriage of Harriet & Robert, 18 May 1813, St Nicholas Harwich ESS. Marriage Register, St Nicholas Harwich Essex. 4. Census: England, 8 Apr 1861, 31 Bear St Nayland SFK. 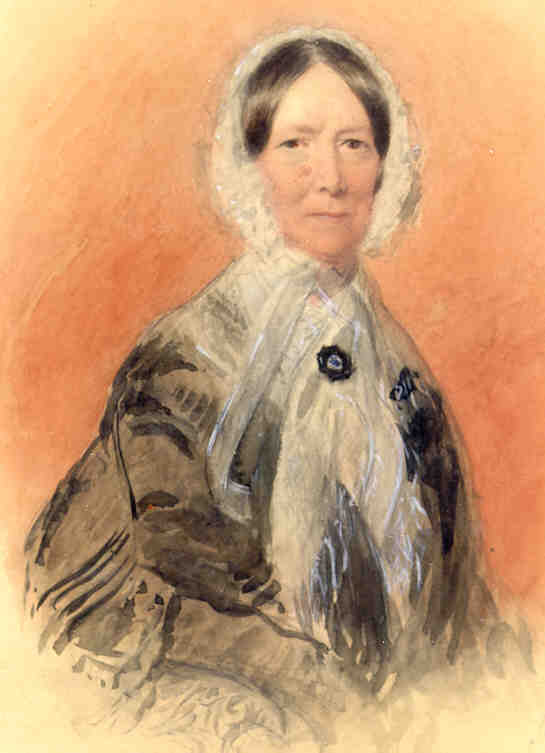 Harriet is described as head of house a widow aged 70 fundholder born Harwich ESS Also in the house was Sarah Daniel a companion aged 60 and a general servant. 5. Harriet's Death, 28 Mar 1864. Harriet married Capt Robert FENN  [MRIN: 76], son of Simon FENN  and Elizabeth UNDERWOOD , on 18 May 1813 in St Nicholas Harwich ESS. (Capt Robert FENN  was christened on 2 Oct 1785 in Coddenham SFK, died on 27 Mar 1844 in Coddenham SFK and was buried on 3 Apr 1844 in Coddenham SFK.). The cause of his death was dropsy.